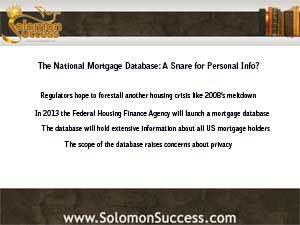 Solomon Success > Blog > The National Mortgage Database: A Snare for the Unwary? “He that is aware of snares shall be secure,” says King Solomon in Proverbs 11:13. Ruler over one of the most prosperous eras in the history of the Kings of Israel, the wise monarch advocated wisdom and prudence in all things. In the book of Proverbs attributed to him he urges people to keep their own counsel and anticipate future pitfalls, or snares. For investors in income property, watching out for possible snares along the way is part of the process. For investors as well as residential homeowners, the national mortgage database may present a massive snare. Or not. As part of the continued fallout from the 2008 housing collapse, the Federal Housing Finance Agency (FHFA) has created a national mortgage database that will capture all that information and more – a move that raises new concerns about privacy and uses of mortgage information. According to a recent article in Fiscal Times, one cause of the housing crash of 2008 was the large number of risky, subprime loans made at a time when getting a loan was amazingly easy and the housing market was flourishing. But because these borrowers were generally financially unstable to begin with, the number of defaults and foreclosures quickly spiraled out of control. Now, lenders and real estate experts alike are trying to analyze what went wrong in an attempt to forestall another meltdown. One problem with creating contingencies to avoid another crisis in the future is that until now, there hasn’t been a way to collect comprehensive data on mortgage loans throughout the country, and to tag and categorize risky mortgages. But that will change with the new national mortgage database being launched in 2013 by the FHFA and the Consumer Financial Protection Bureau (CFPB)/. This database is expected to hold extensive information about the nation’s mortgage holders. The FHFA and CFPB see it as an early warning system, making it possible to track and monitor potentially risky mortgages, and to head off another sudden crisis like the one in 2008. The database would make it possible to create a profile of the nation’s mortgages and identify those at risk for trouble. But the database would contain much more data than just an individual’s name, address and terms of the loan. Lenders would be expected to report the borrower’s credit profile, terms of the loan, payment history and information about the property involved. But more than that, the database would also collect information unrelated to the mortgage, but relevant to the borrower’s financial stability such as student loans, a history of late payments on bills and credit cards, and more. Housing all this data in one place, and particularly data that has nothing to do with the mortgage itself, raising concerns about privacy and the potential for misuse of the information, particularly since neither the FHFA nor the CFPB have made it exactly clear just who would have access to the data, and for what purposes. The Cap’s Inspector General said in November 2012 that the CFPB has no comprehensive information security strategy in place for managing the information that’s reported. But proponents argue that the information will be safe and borrowers’ identities not made public, and that the collection of this kind of data will help regulators identify risky loan products and potentially unstable borrowers before the situation spirals out of control again – which benefits the country as a whole as well as individual mortgage holders in need of help. The national mortgage database will hold information on all mortgage loans, regardless of who holds them. Whether it lives up to its expectations or not, investors working with Jason Hartman’s property investing system as well as residential homeowners can expect to find their information there.